One of Guru Kelucharan Mahapatra's senior disciple, Rina went through years of severe discipline and hard work. Under Sanjukta Panigrahi's affectionate instructions, Rina has emerged as one of the frontline exponents of this picturesque art. As an acknowledged master of the complex and difficult art of Odissi Rina has already carved a niche for herself. To see her graceful and lucid movements on stage is to believe in the power of art in her, the frozen icons of Konark and hundreds of other Orissa temples have found a consummately able interpreter and exponent. Abhinaya or interpretative dance is her forte where she excels in the varying nuances of a composition. Her flawless execution of the brilliant and difficult choreography establishes a spontaneous rapport with the connoisseures of the genre. Rina's graceful expressiveness combined with her natural good looks, have earned her many laurels, not the least of which was her performance in Germany in the “Festival of India”. She has enthralled thousands with her wellgroomed performances on events such as the KONARK DANCE FESTIVAL, VRINDAVAN NATIONAL FESTIVAL, NISHAGANDHI FESTIVAL or KALAKSHETRA FOUNDATION. Rina performs as a Top Grade Artist in Doordarshan and Outstanding Grade Artist in ICCR, New Delhi. She is also empanelled with Sangeet Natak Academy, India International Rural Cultural Centre (New Delhi), State Music Academy. Rina is an External Examiner with Rabindra Bharati University & Rajya Sangeet Academy. She is the Head of Odissi dept. Of Calcutta School Of Music. 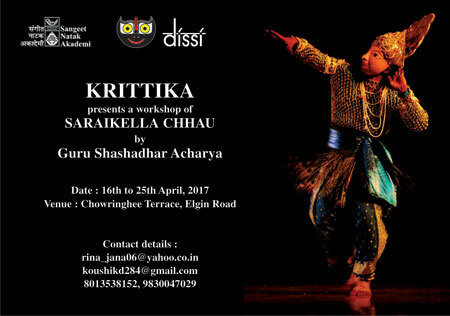 Being the Secretary of “Krittika” an NGO working in the field of Odissi dance / dance therapy and member of West Bangal Dance Group Federation and founder member of Odissi Dancers’ Forum Of Kolkata. She handles her responsibility with ease. For her extra ordinary Performances & Contribution in Odissi she won SHRINGERMONI AWARD in 25th Kal - Ke - Kalakar Sangeet Sammelan 1988 & SANJUKTA PANIGRAHI SAMMAN AWARD in 2005.